Box Text: Ops Isn't Over Yet! 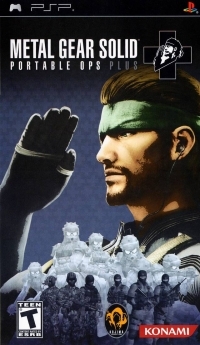 Metal Gear Solid: Portable Ops Plus is a stand alone addition to the 2006 award winning title of the same name. Focusing on a portable multiplayer experience, players will be able to enjoy more maps, more missions, and recruit a talented crew of war heroes for battling real opponents in online arenas. 09-06-2011 scott Box Text Ops Isn't Over Yet! 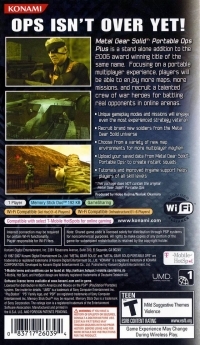 Metal Gear Solid: Portable Ops Plus is a stand alone addition to the 2006 award winning title of the same name. Focusing on a portable multiplayer experience, players will be able to enjoy more maps, more missions, and recruit a talented crew of war heroes for battling real opponents in online arenas. 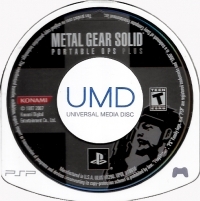 This is a list of VGCollect users who have Metal Gear Solid: Portable Ops Plus in their Collection. This is a list of VGCollect users who have Metal Gear Solid: Portable Ops Plus in their Sell List. This is a list of VGCollect users who have Metal Gear Solid: Portable Ops Plus in their Wish List.